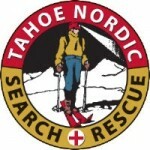 First conceived in 1976 in response to the death of a boy lost in a blizzard, the all-volunteer Tahoe Nordic Search and Rescue Team (TNSAR) has in the years since rescued over 500 people and conducted over 300 searches throughout the greater Tahoe Sierra. Forty two years ago, when the boy and his friend went missing off the backside of Northstar ski resort, there was no organized backcountry rescue team to help in the search. Desperate phone calls to local Nordic skiers, snowmobilers and snowcat owners produced a search party that eventually located the boys, but for one of them it was too late. This group of skiers, along with the boy’s father, learned there was an important void to be filled. TNSAR was born. Based in the North Lake Tahoe/Truckee area, the Team has matured considerably over four decades but the mission remains the same: Conducting fast, safe rescues 12 months of the year and educating the public on winter safety. TNSAR is a non-profit 501c3 100% volunteer organization. They do not charge for their services nor has anyone in the organization ever taken a paycheck. TNSAR has been largely supported by its primary fundraiser — “The Great Ski Race,” held at the beginning of March. In some years, the event was the largest cross-country ski race west of the Mississippi. But in recent winters, the race has been cancelled due to lack of snow. The Great Trail Race donates a percentage of entry fees to TNSAR.